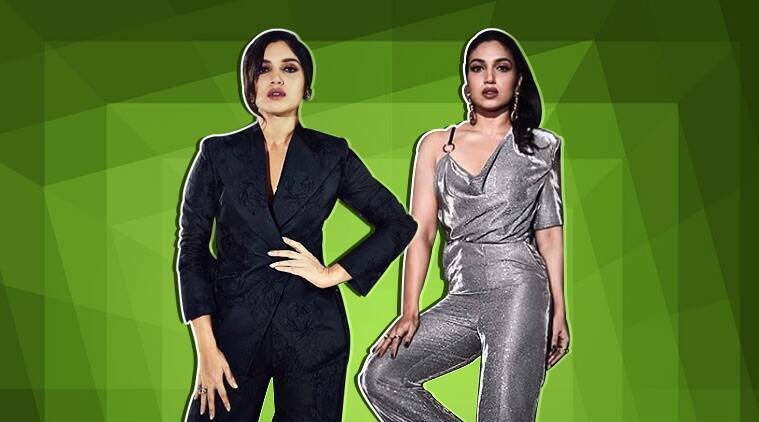 Bhumi Pednekar has made her mark in the movie industry over the years and has wowed the audience with her acting prowess. On the fashion front too, the Sonchiriya actor has shown versatility by teaming up with varied stylists and experimenting with silhouettes, cuts and colours. This time, for the promotions of her upcoming release Sonchiriya, the actor was styled by fashion stylist Shaleena Nathani. Pednekar looked stunning in a metallic silver Nikhil Thampi ensemble, which was showcased at the recently concluded Lakme Fashion Week Summer/Resort 2019 edition. She teamed the one-shouldered jumpsuit with statement earrings and rings from Viange Vintage. She kept her hair tied in a sleek high ponytail, and opted for make-up which defined her eyes well and wore mauve-tinted lip colour which rounded off her look. At another event, she looked like a boss lady in a black pantsuit by Ashish Soni which she wore with Zara shoes. Prior to this, the actor was seen in a black velvet embellished dress that she teamed with an animal print jacket. We feel it was a tricky fashion choice to make, but she pulled it off like a pro. Her ethnic fashion choices too are right on point. We spotted the actor attending Priyanka Chopra and Nick Jonas’ wedding ceremony clad in a gorgeous white-coloured lehenga by Dolly J. The embellished lehenga featured floral embroidery, and the actor teamed it with a statement neck piece. She added a pop of red to her lips which complemented her look beautifully. Gully Boy promotions: Would you dare to try Ranveer Singh’s colourful outfits? Copyright © 2019 Expressbizlife | All rights reserved.